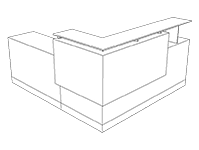 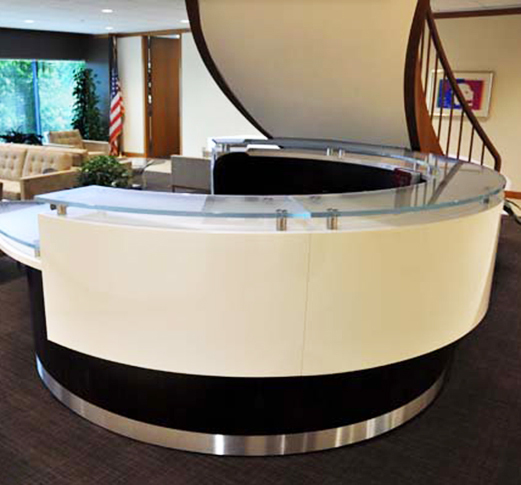 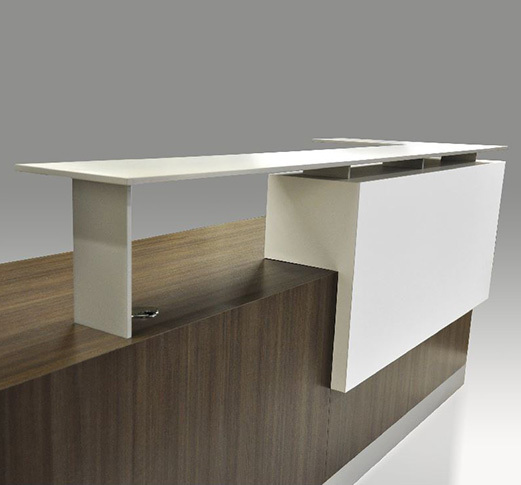 Features of cube on the corner of the desk adds an interesting element to any application. 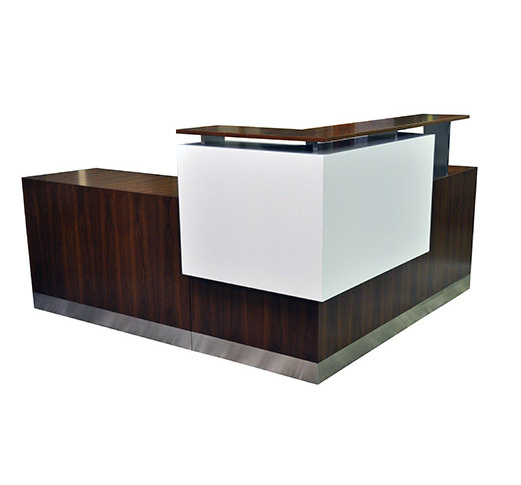 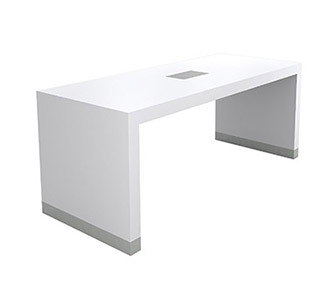 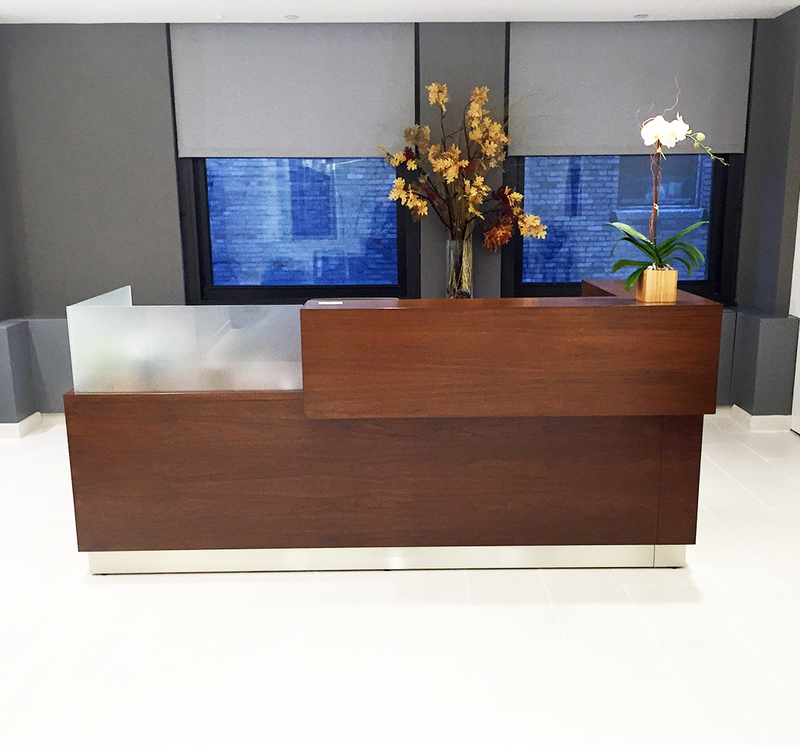 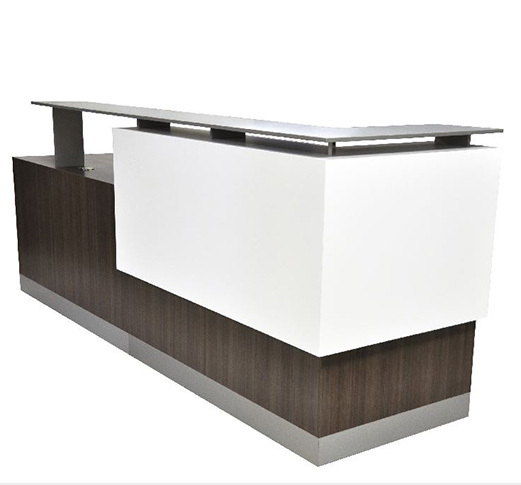 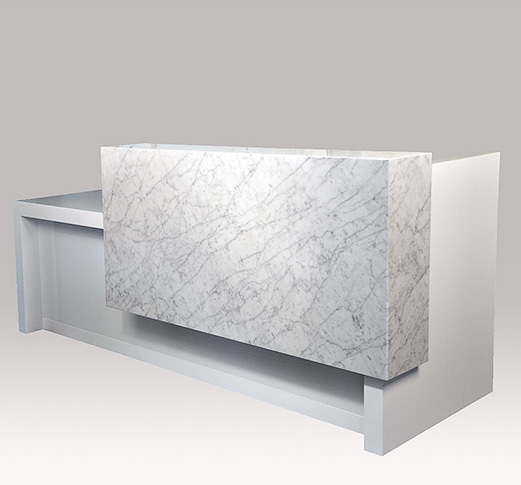 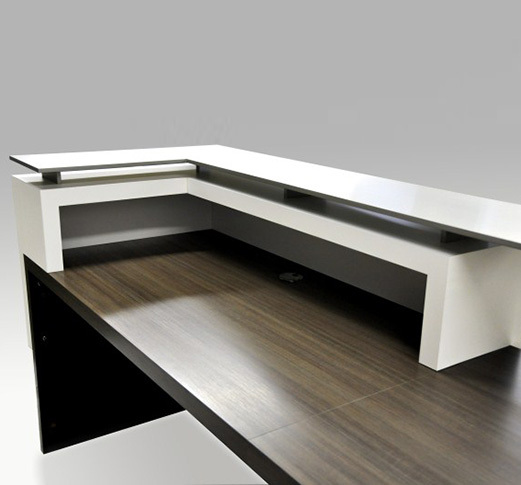 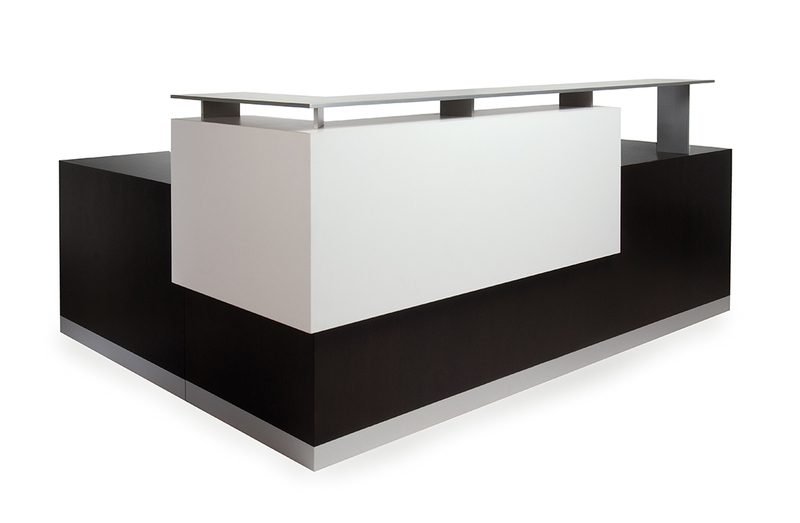 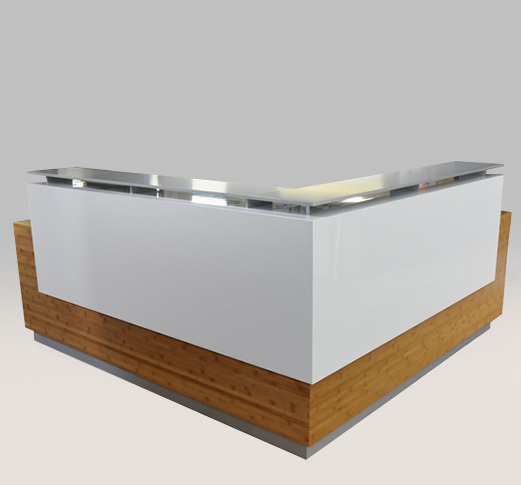 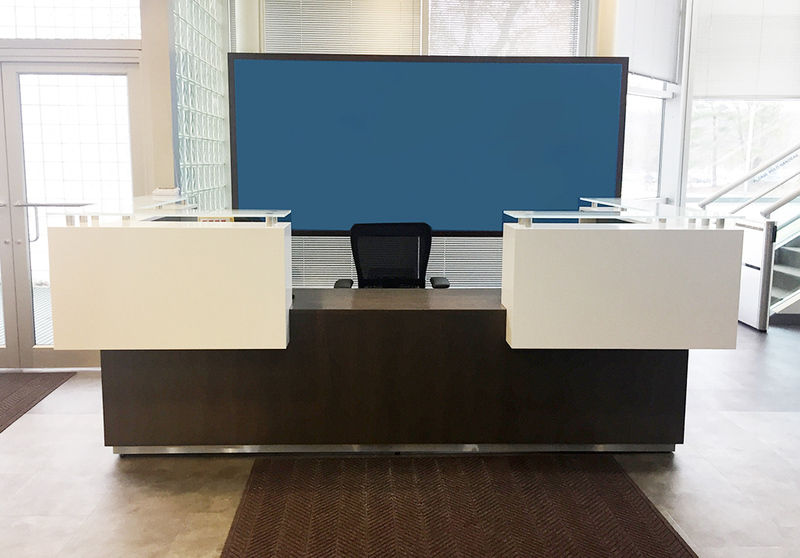 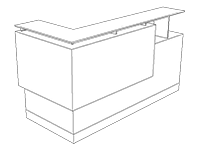 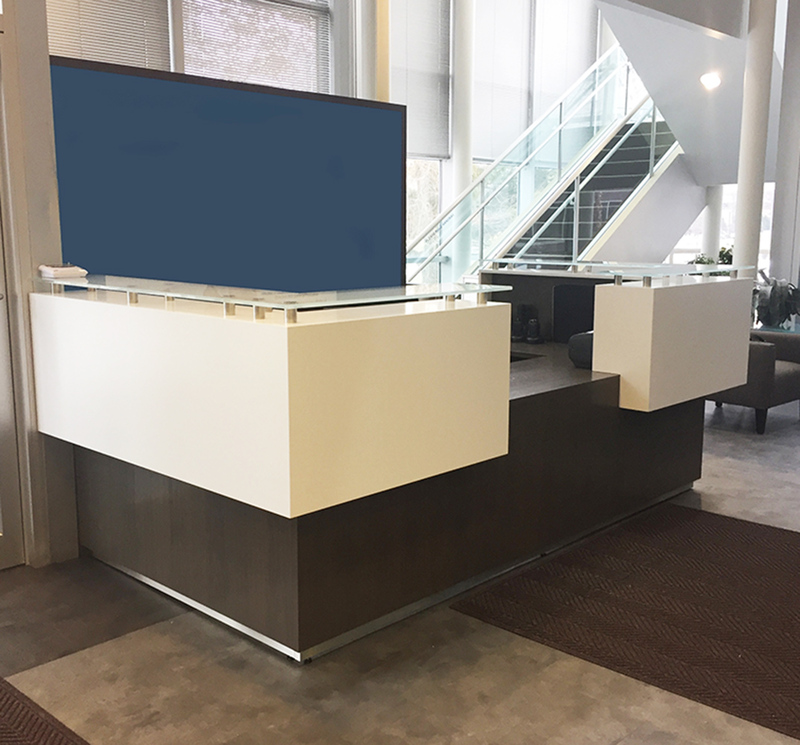 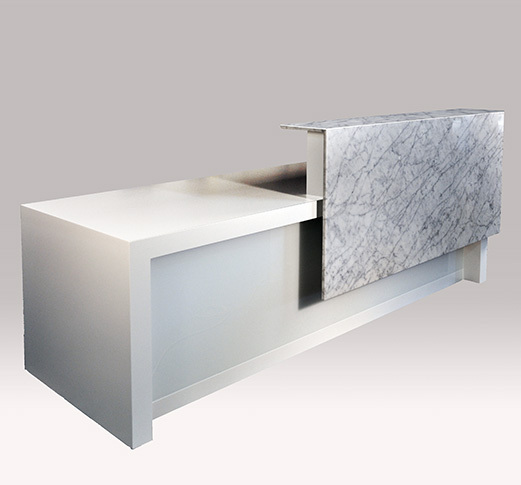 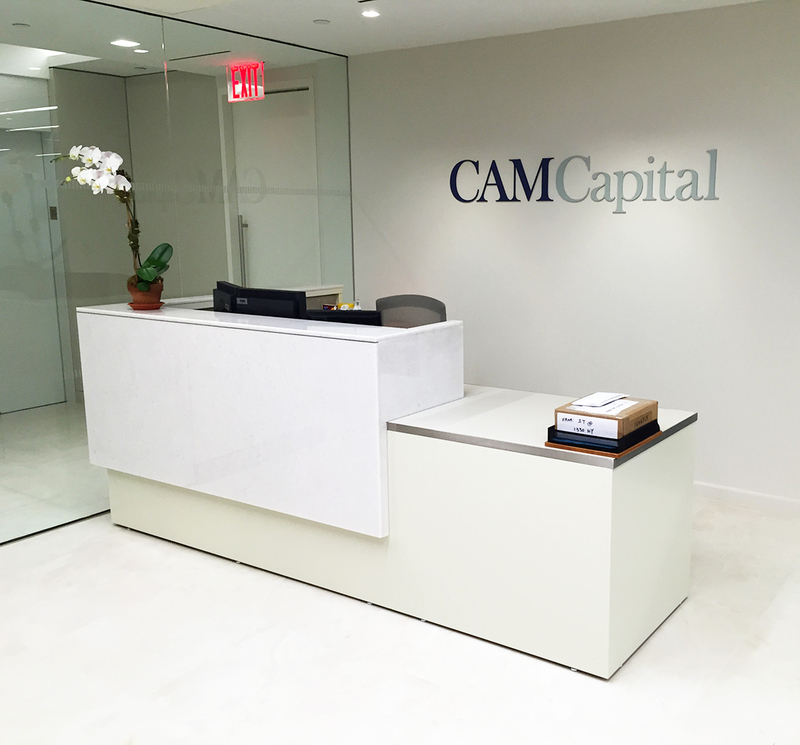 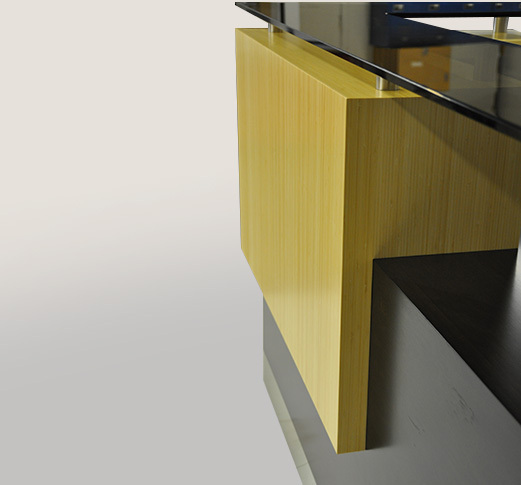 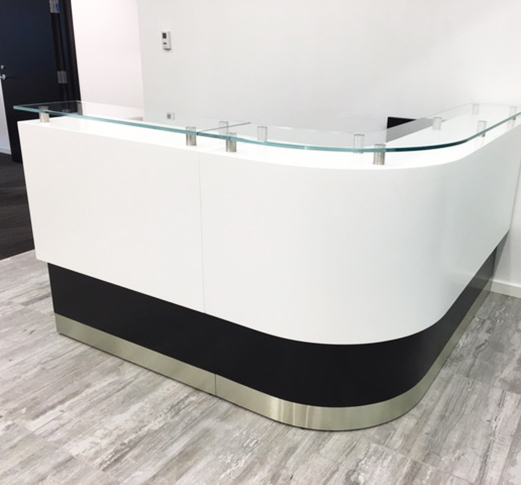 Solid anodized aluminum transaction counter on aluminum support legs, matte white color core sub-top and Arnold standard finish wood chassis and work surface. 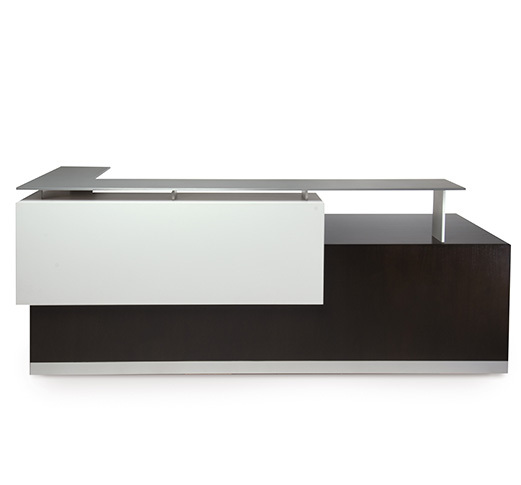 Arnold standard Cappuccino Walnut on the chassis, Arnold standard matte white lacquer sub-top, satin aluminum transaction top with matching stand-offs. 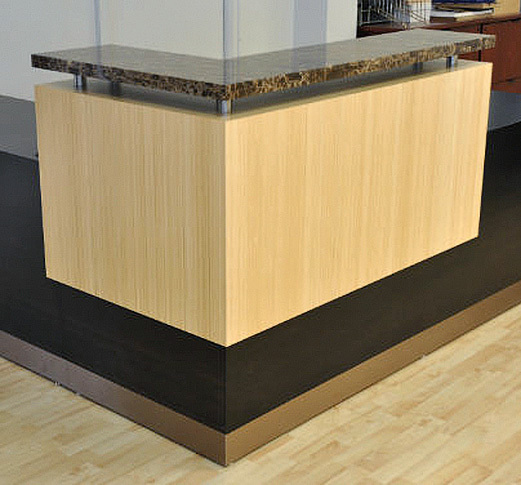 Bronze glass transaction top with aluminum cylindrical stand-offs on a bamboo sub-top, contrasting chassis in ebonized bamboo. 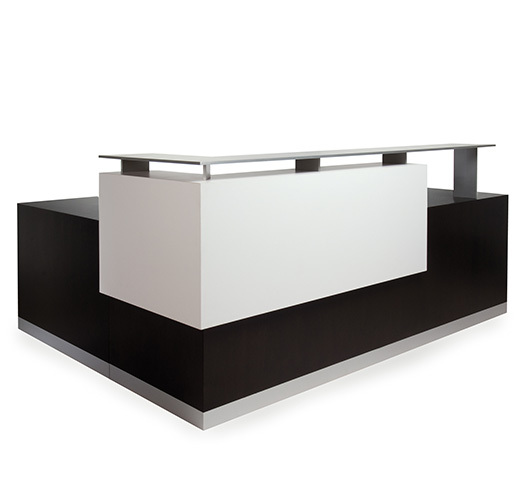 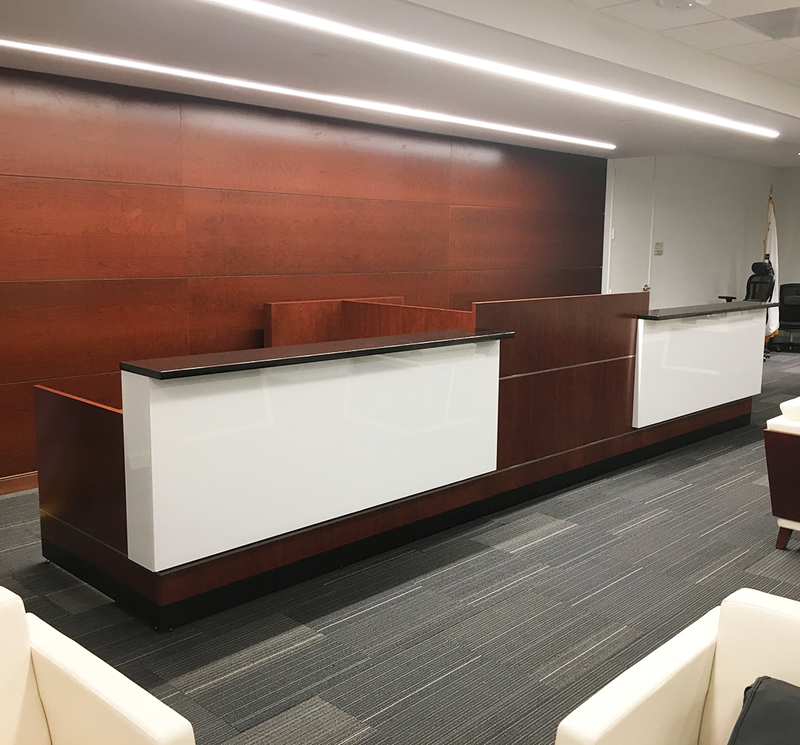 1/2" anodized aluminum transaction top, Formica glossy Colorcore Kube, Carmelized Moso Bamboo on the chassis, brushed stainless steel recessed base. 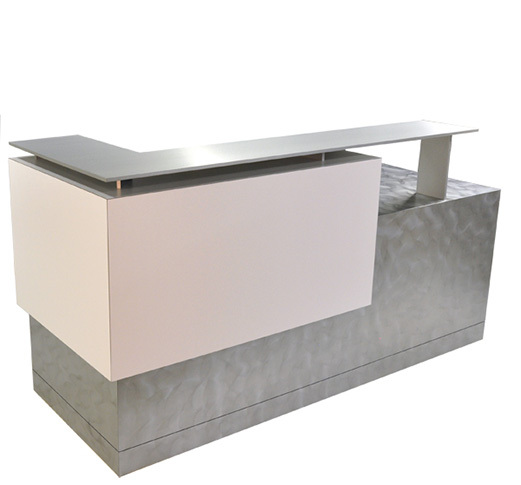 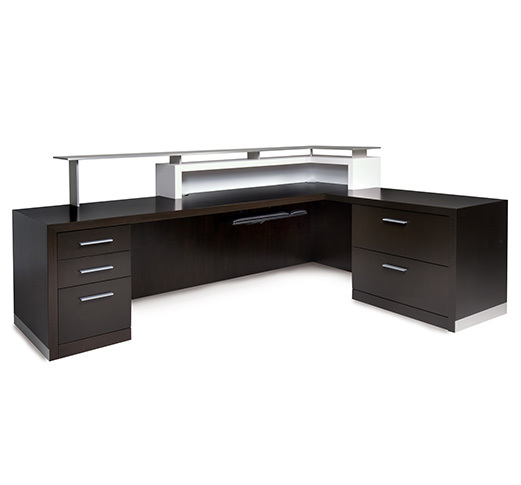 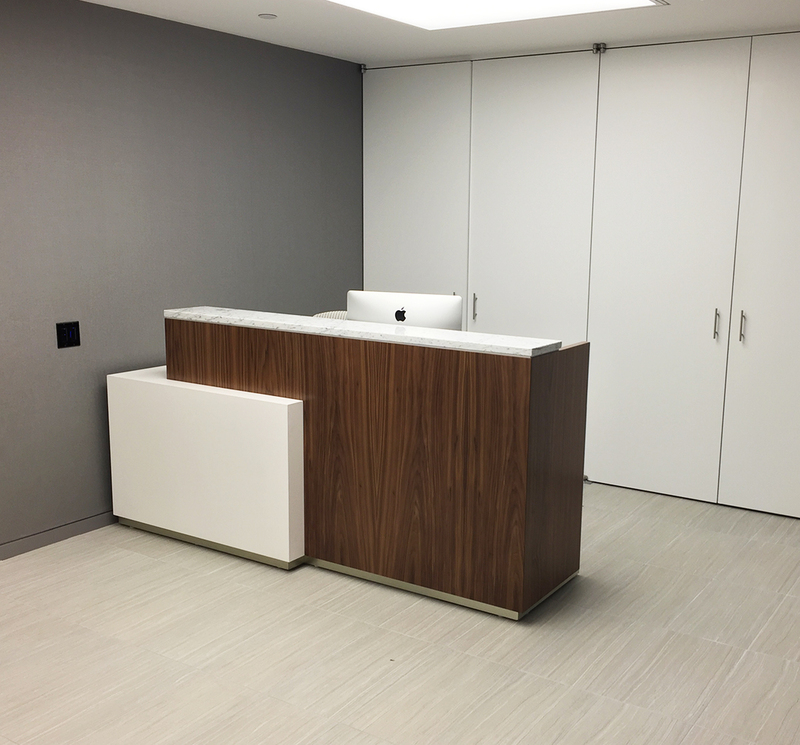 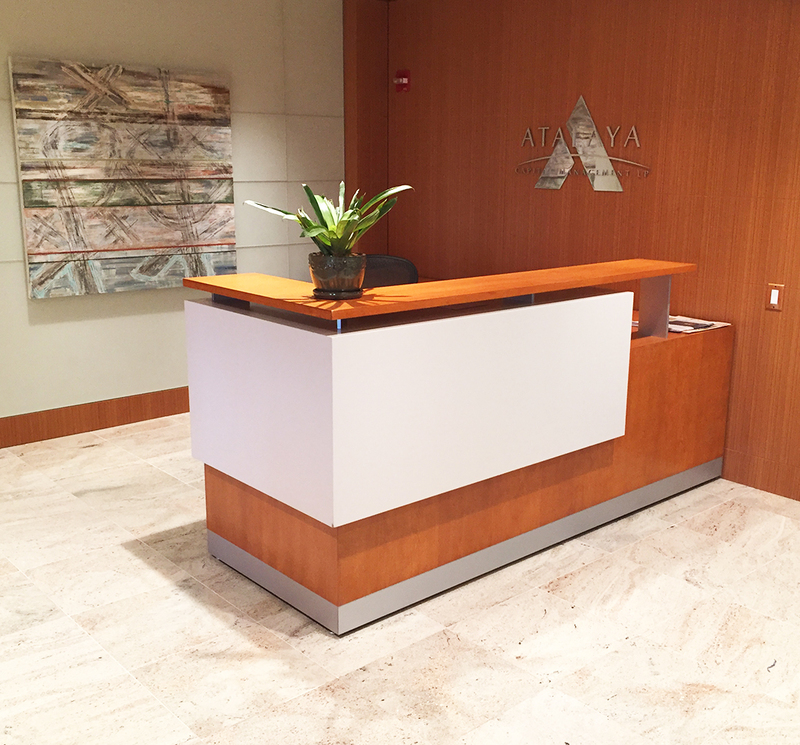 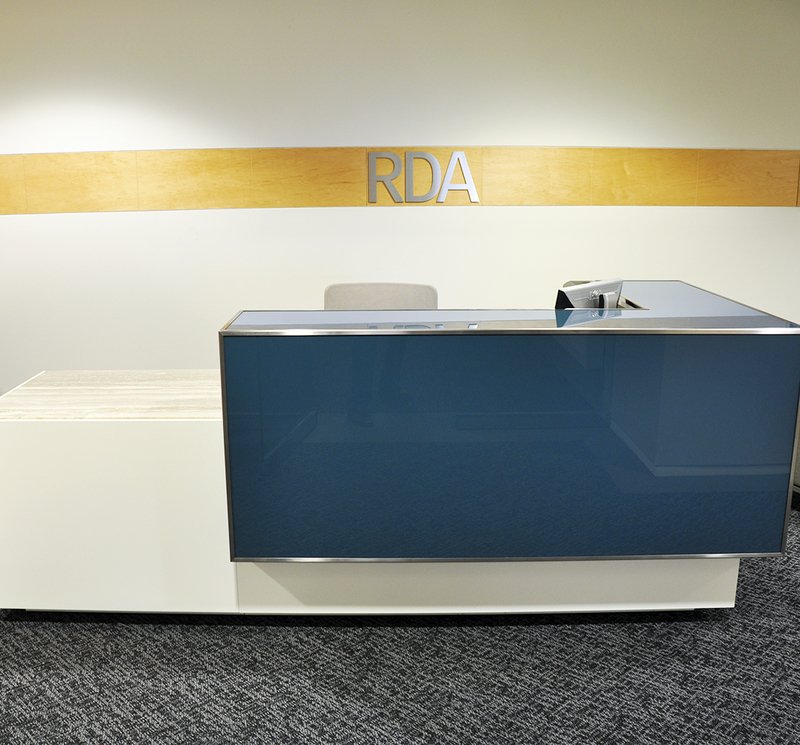 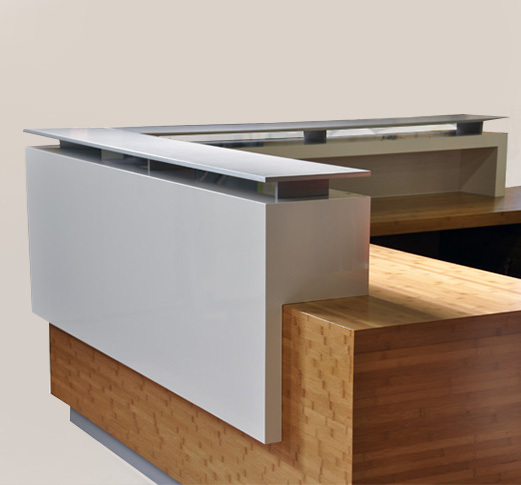 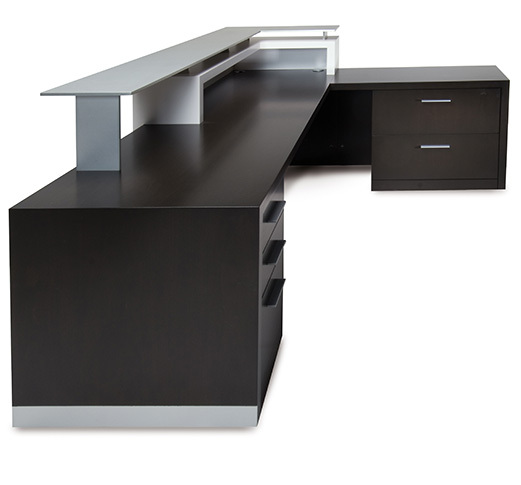 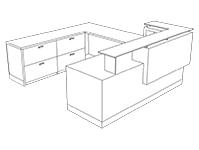 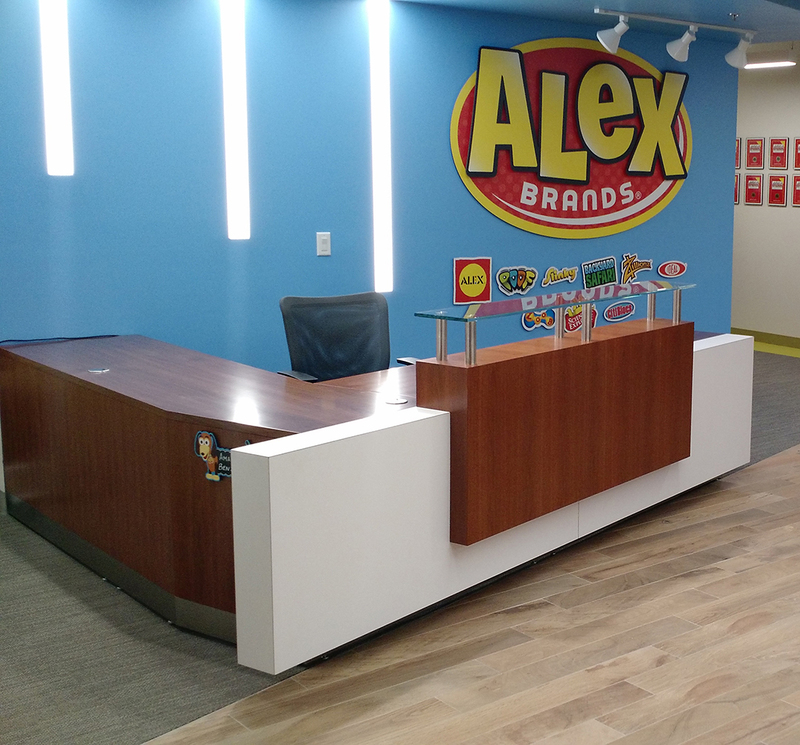 Dover White formica kube, 1/2" annodized aluminum counter on alumium stand-offs, DecoMetal chassis in Soft Brushed Aluminum. 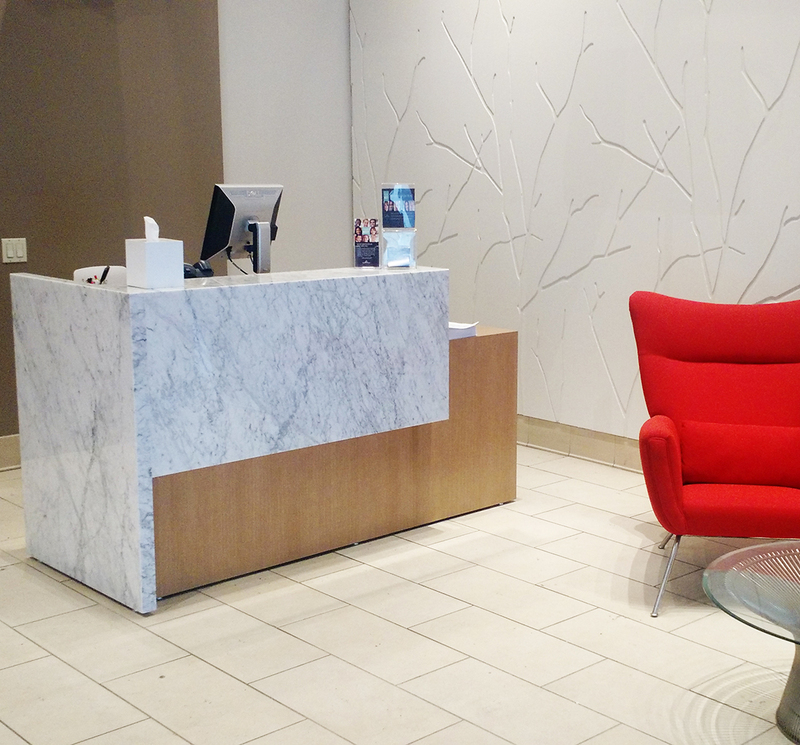 Frosted glass front with marble waterfall cube. 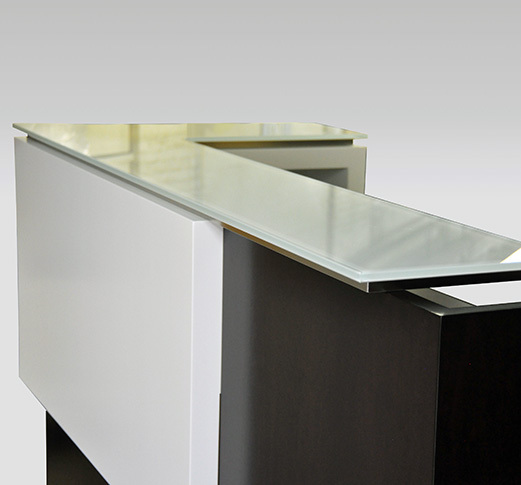 White back-painted glass, sitting on top of brushed stainless steel. 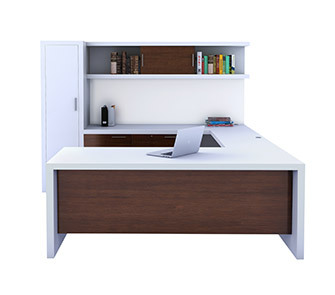 Arnold standard white lacquer Kube, with cherry stain to match control sample, flush toe kick with reveal. 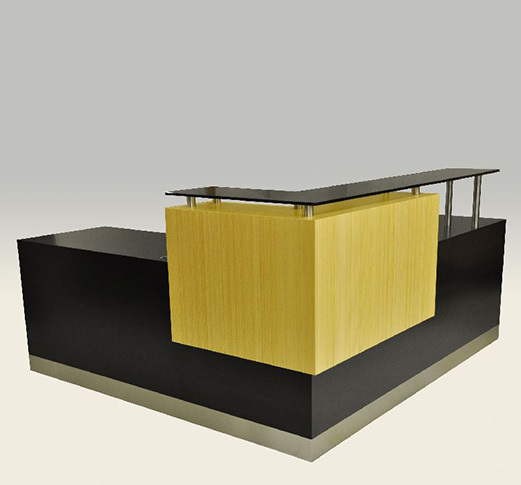 Bamboo cube with granite transaction top. 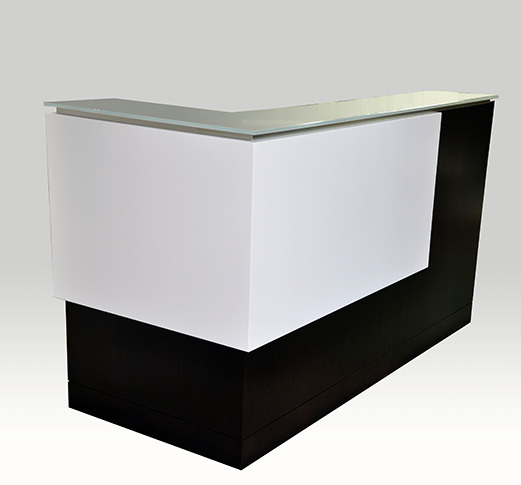 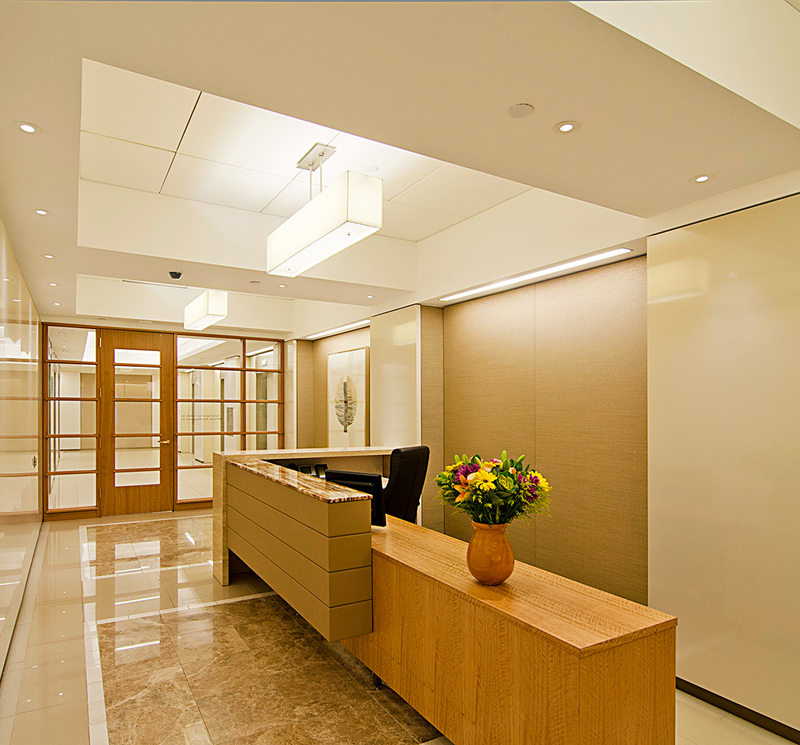 White lacquer cube with veneer transaction top.